Stationary fuel cells have achieved grid parity, in many cases; improve and lower energy costs; and are on the cusp of becoming commercially viable. A fuel cell is an electro-chemical device that combines hydrogen and oxygen to create water,with useful heat and electricity as it's byproducts. Fuel cells have the potential to replace the internal-combustion engine in vehicles and provide power in stationary and portable power applications because they are energy-efficient, clean, and fuel-flexible. Hydrogen or any hydrogen-rich fuel can be used by this emerging technology. 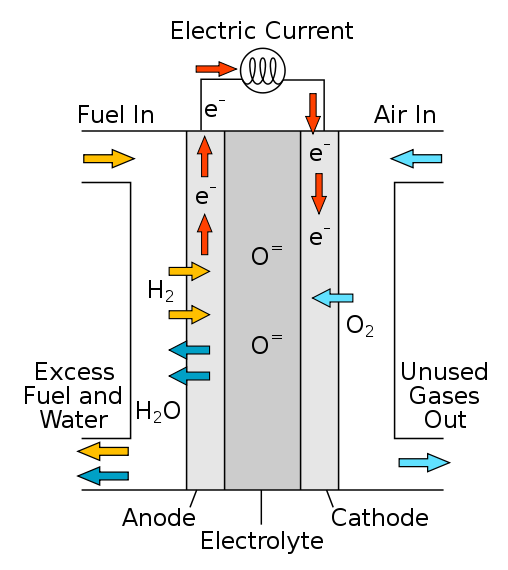 Both fuel cells and batteries have two electrodes separated by an electrolyte. As with batteries the energy is converted to electrical form by chemical reactions but unlike battery cells the energy is derived from fuel which is dissipated in the discharge process and the fuel cell is "charged" by providing fresh fuel. In operation fuel cells run hot or very hot. AFC - Alkaline Fuel Cells - Originally used in the space program, Performance is high, but so is cost. Ammonia Synthesis - The concept is to use energy generated by remote or offshore wind turbines to perform "solid-state ammonia synthesis" and transport that ammonia by land or sea to be used as a fuel. This obviates the need for distant wind farms to be expensively connected to the grid. DMTC - Direct Methanol Fuel Cell - use liquid methanol as a fuel and is being developed for small applications like laptop and cell phone batteries. Their main advantage is the ease of transport of methanol, an energy-dense yet reasonably stable liquid at all environmental conditions. Efficiency is quite low for these cells, so they are targeted especially to portable applications, where energy and power density are more important than efficiency. A more efficient version of a direct fuel cell would play a key role in the theoretical use of methanol as a general energy transport medium, in the hypothesized methanol economy. MCFC -Molten Carbonate Fuel Cells - Operate like SOFC’s, except the electrolyte consists of liquid (molten) carbonate, which is a negative ion and an oxidizing agent. Because the electrolyte loses carbonate in the oxidation reaction, the carbonate must be replenished through some means. This is often performed by recirculating the carbon dioxide from the oxidation products into the cathode where it reacts with the incoming air and reforms carbonate. High efficiency, resistant to contamination and can run on hydrocarbon fuels. They run at high temperatures and are being developed for utility applications. Because of high temperatures, durability is often an issue. PAFC - Phosphoric-Acid Fuel Cells - Comprise the largest segment of existing CHP products worldwide and can provide combined efficiencies close to 90% (35-50% electric + remainder as thermal) This type of fuel cell uses liquid phosphoric acid as an electrolyte. The electrodes are made of carbon paper coated with a finely-dispersed platinum catalyst, which make them expensive to manufacture. They are not affected by carbon monoxide impurities in the hydrogen stream. Phosphoric acid solidifies at a temperature of 40 °C, making startup difficult and restrains PAFCs to continuous operation. At an operating range of 150 to 200 °C, the expelled water can be converted to steam for air and water heating. Phosphoric acid fuel cells have been used for stationary applications with a combined heat and power efficiency of about 80%, and they continue to dominate the on-site stationary fuel cell market. PEM - Proton Exchange Membrane Fuel Cells - A type of fuel cell being developed for transport applications as well as for stationary fuel cell applications and portable fuel cell applications. Their distinguishing features include lower temperature/pressure ranges (50-100 degrees C) and a special polymer electrolyte membrane. Often used in vehicle applications because of their fast response time. Cost is a factor as they use platinum catalysts. SOFC – Solid Oxide Fuel Cell - Use ceramics in their electrodes. The anode and cathode are separated by an electrolyte that is conductive to oxygen ions but non-conductive to electrons. The electrolyte is typically made from zirconia doped with yttria. Unlike PEMFC’s, the catalysts in SOFCs and MCFCs are not poisoned by carbon monoxide, due to much higher operating temperatures. Because the oxidation reaction occurs in the anode, direct utilization of the carbon monoxide is possible. Unlike PEM fuel cells, solid oxide fuel cells don’t contain platinum at all. SOFC's can work with a variety of fuels other than hydrogen and are relatively compact. In SOFCs the challenge is trying to match up dissimilar materials with different expansion rates, oxidation rates, etc. Keeping the units sealed and the interconnects working are tough engineering questions. One research direction is to drive operating temperatures down, so that cheaper and somewhat less durable materials can be used. The other research direction is to come up with more durable high-temp materials and coatings (requiring a mix of alloy, glass and ceramic materials wizardry). Progress, even slowly, is being made. Their disadvantages are that they are quite heavy and run at very high temperatures. Because of the high temperatures required, it takes time for them to heat up, which means that they cannot respond instantaneously to changes in electrical demand, making them suitable only for base load applications. Worldwide markets for stationary fuel cells are poised to achieve significant growth based on providing distributed power for campus environments achieve better technology and economies of scale. The stationary fuel cell market stood at $793.7 million in 2012, and WinterGreen Research forecasts this will increase to $14.3 billion by 2020. Growth is anticipated to be based on demand for distributed power generation that uses natural gas. According to Navigant Research, the market for stationary fuel cells is transitioning toward maturity and wider adoption, buoyed by improving economics, government support, and growing demand for resilient, dispatchable power. In recent years, promises of imminent profitability and mass adoption have inspired optimism, though results have often fallen short of what the hype might suggest. Claims of earthshaking breakthroughs are giving way to persistent cost declines, product improvements, and business model innovations. These are making fuel cells viable in a growing range of markets and opening new opportunities for stakeholders that are prepared for the transition. Stationary fuel cells are becoming commercially established. Over 150,000 micro-combined heat and power (MCHP) units have been installed in Japan, where prices have fallen under the successful ENE-FARM subsidy. In the United States and South Korea, major energy players like Apple, Constellation Energy, and POSCO Energy have invested millions in fuel cell projects. Large global conglomerates are entering the market, too; GE, Doosan, and LG have each made significant investments and expect to realize returns in the medium term. Meanwhile, strong policy support in Japan and South Korea will drive broad adoption, as it will in other advanced economies in North America and Europe. According to Navigant Research, annual installed stationary fuel cell capacity is expected to grow worldwide from 262.6 MW in 2016 to 3,069.5 MW in 2025. Stationary fuel cells have achieved grid parity, in many cases; improve and lower energy costs; and are on the cusp of becoming commercially viable. Generating power on-site, rather than centrally, eliminates the cost, complexity, interdependencies, and inefficiencies associated with energy transmission and distribution. Distributed energy is evolving in a manner like distributed PC and laptop computing, cars for transportation, and smart phones. As distributed Internet data and telephony have found a place in the market, so also will distributed energy generation become widespread. Stationary fuel cells represent the base for distributed power generation worldwide. Generating power on-site, rather than centrally, eliminates the cost, complexity, interdependencies, and inefficiencies associated with energy transmission and distribution. Distributed energy is evolving in a manner like distributed PC and laptop computing, cars for transportation, and smart phones. As distributed Internet data and telephony have found a place in the market, so also will distributed energy generation become widespread. Renewable energy is intermittent and needs stationary fuel cells for renewables to achieve mainstream adoption as a stable power source. Wind and solar power cannot be stored except by using the energy derived from these sources to make hydrogen that can be stored. Stationary fuel cells are likely to function as a battery in the long term, creating a way to use hydrogen that is manufactured from the renewable energy sources. It is likely that the wind and tide energy will be transported as electricity to a location where the hydrogen can be manufactured. It is far easier to transport electricity than to transport hydrogen. Hydrogen serves as an energy storage mechanism. While the fuel cell ultimately releases carbon dioxide, it is far more efficient – and thus less polluting – than consuming natural gas at home or burning natural gas at a power plant and delivering electricity down the wire. When consumers burn gas at home, they typically generate heat but not electricity. Burning it at power plants generates electricity, but also results in waste heat, which usually doesn't get converted into productive energy. Power also gets lost in transmission. Because it can deliver heat and power, the fuel cell is around 90 percent efficient. Each type of fuel cell is best suited to specific applications. Exceptionally Low/Zero Emissions - Carbon free when using H2 and O2. Efficient - Compared to the internal combustion engine which operates at about 30%. Provides base load power Can be run in reverse for energy storage, producing hydrogen from electricity and water. Durability - particularly at high temperatures. Stationary fuel cell applications typically require more than 40,000 hours of reliable operation at a temperature of -35 °C to 40 °C (-31 °F to 104 °F), while automotive fuel cells require a 5,000 hour lifespan (the equivalent of 150,000 miles) under extreme temperatures. Current service life is 7,300 hours under cycling conditions. The stacks that make up a fuel cell, and create the reaction that produces electricity, often last only about two to five years. This is common for different types of fuel cells like solid oxide fuel cells (Bloom Energy makes this type) or proton exchange membrane (PEM) fuel cells, like what ClearEdge Power builds. A fuel cell’s stacks fill a chamber called the hot box, and it’s this chamber that gets swapped out of these fuel cells every few years. The stack contains a catalyst, often platinum, which, when combined with the fuel source (natural gas or hydrogen) and oxygen create electricity. Over time, as the fuel and oxygen are constantly being pumped in and run over the catalyst in the stacks, the chemicals start to degrade and the system starts to wear down. The short life span of the hot box is a key problem for the capital costs of fuel cell makers. The hot box can make up a significant portion of the fuel cell, as high as 50 to 75 percent of the cost of the system. Efficiency- The efficiency for hydrogen storage is typically 50 to 60% overall, which is lower than pumped storage systems or batteries. About 50 kWh (180 MJ) is required to produce a kilogram of hydrogen by electrolysis, so the cost of the electricity clearly is crucial, even for hydrogen uses other than storage for electrical generation. Cost - Hydrogen is expensive to produce. The membranes inside the fuel cells don't last long and the membranes also require lots of platinum to generate the electricity-producing reaction. The entire world production of platinum isn't large enough for 10 million cars. At $0.03/kWh, common off-peak high-voltage line rate in the U.S., this means hydrogen costs $1.50 a kilogram for the electricity, equivalent to $1.50 a US gallon for gasoline if used in a fuel cell vehicle. Other costs would include the electrolyzer plant, hydrogen compressors or liquefaction, storage and transportation, which will be significant. In 2002, typical fuel cell systems cost US$1000 per kilowatt of electric power output. In 2008, the Department of Energy reported that fuel cell system costs in volume production are $73 per kilowatt. The goal is $35 per kilowatt. In 2008 UTC Power has 400kW stationary fuel cells for $1,000,000 per 400kW installed costs. The goal is to reduce the cost in order to compete with current market technologies including gasoline internal combustion engines. Many companies are working on techniques to reduce cost in a variety of ways including reducing the amount of platinum needed in each individual cell. Ballard Power Systems have experiments with a catalyst enhanced with carbon silk which allows a 30% reduction in platinum usage without reduction in performance. Water and Air Management in PEMFCs - In this type of fuel cell, the membrane must be hydrated, requiring water to be evaporated at precisely the same rate that it is produced. If water is evaporated too quickly, the membrane dries, resistance across it increases, and eventually it will crack, creating a gas "short circuit" where hydrogen and oxygen combine directly, generating heat that will damage the fuel cell. If the water is evaporated too slowly, the electrodes will flood, preventing the reactants from reaching the catalyst and stopping the reaction. Methods to manage water in cells are being developed like electro-osmotic pumps focusing on flow control. Just as in a combustion engine, a steady ratio between the reactant and oxygen is necessary to keep the fuel cell operating efficiently. Temperature Management - The same temperature must be maintained throughout the cell in order to prevent destruction of the cell through thermal loading. This is particularly challenging as the 2H2 + O2 -> 2H2O reaction is highly exothermic, so a large quantity of heat is generated within the fuel cell. Robustness - Many are sensitive to temperature and contamination. AFC Energy - Cranleigh, Surrey, England - An industrial fuel cell power company focused on large-scale stationary applications. Altergy Systems - Folsom, CA - Designs and manufactures proton exchange membrane fuel cell systems for telecommunications, data centers, and other mission-critical power applications in the United States and internationally. The company offers fuel cell backup systems and modules primarily for stationary power systems that provide primary or backup power for commercial or residential use; portable systems, such as generators or battery replacements; and motive applications, such as automobiles, forklifts, buses, and other vehicles. It also provides uninterruptible power supplies for information processing centers, acute medical care, homeland security, and other operations. Ballard Power (NASDAQ: BLDP) Burnaby, BC - Designs and manufactures clean energy hydrogen fuel cells. Their FCgen family of products delivers the Power to Change end user applications and business results. Backup Power - Enhances telecom network reliability with fuel cell powered backup power solutions. Residential Cogeneration - Enables consumers to gain energy independence in Japan using a fuel cell cogeneration system. 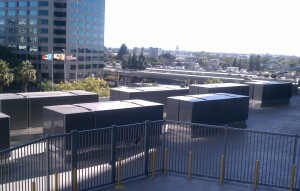 Bloom Energy - Sunnyvale, CA - The Bloom Energy Server (the Bloom Box) is a solid oxide fuel cell (SOFC) that can use a wide variety of inputs (including liquid or gaseous hydrocarbons produced from biological sources) to generate electricity on the site where it will be used. It can withstand temperatures of up to 1,800 °F (980 °C), that would cause many other fuel cells to break down or require maintenance. According to the company, a single cell (one 100 mm × 100 mm metal alloy plate between two ceramic layers) generates 25 watts. Bloom stated that two hundred servers have been deployed in California for corporations including eBay, Google, and Wal-Mart. Bloom has been quite secretive about the inner workings of their Solid Oxide Fuel Cell (SOFC), which can generate electricity directly from natural gas and oxygen without combustion. There has been little to nothing in the way of technical publications or presentations at the many Fuel Cell Conferences. The manufacturer says it will eventually market hand-held units powerful enough to run a single home for $3,000. The power will reportedly be cheaper than that purchased from standard power plants. Is the box as game-changing as its backers believe? Well, as 60 Minutes put it, it may just do to the power plant what the laptop did to the desktop because it doesn't require a grid. The company has evolved their business model away from selling the units to a service that they call Electrons, which is more of a purchase power agreement. The customers commit to a ten-year deal, buying electricity at a fixed price while Bloom installs and maintains the units. They claim that they are looking for customers that currently spend $25,000 per month on electricity or more. Bloom Energy posted $42 million of pro forma revenue and negative $61 million of pro forma operating income for Q1 2013, according to documents obtained by Fortune. Those figures are lower than Bloom results for both Q3 and Q4 2012. Bloom also reports negative $1.03 billion in retained earnings, compared to a negative $873 million mark through Q3 2012. To date, it has raised more than $1.1 billion in venture capital funding, including past investments from Kleiner Perkins Caufield & Byers, New Enterprise Associates, Advanced Equities, DAG Ventures and Goldman Sachs. But there are questions that remain unanswered. For one thing the Bloom Boxes, which the company calls energy servers, cost upwards of $800,000 for a 100kW system. While the company has not yet disclosed their operating costs, outside estimates project roughly $0.13 per kWh without incentives, which is higher than current market rate. The company claims a carbon footprint that is half of traditional power, but with no price on carbon, that could be a hard sell. Another issue is product reliability. Bloom’s basic cell produces only 25 watts. That means that each 100kW module will contain 4000 cells requiring two interconnects each, always a trouble spot, especially in a device such as this that experiences big temperature swings. Ceres Power (LSE: CWR.L ) - Horsham, Sussex, United Kingdom - Developing fuel cell technology for use in small scale combined heat and power products for the residential sector and in energy security applications. Targeting global mass market opportunities in microgeneration for use in residential, commercial and leisure applications worldwide. Doosan Fuel Cell America - South Windsor, CT - (formerly ClearEdge Power, Inc.) - A fuel cell manufacturer focusing on the stationary fuel cell. The company employed 225 people as of August 2011. It closed its operations in Connecticut in April 2014, and filed for Chapter 11 bankruptcy protection in May 2014. The company has been merged with Fuel Cell Power under a new name Doosan Fuel Cell . CleanEdge Power sold a 5-kilowatt fuel cell for $56,000, or more than $10,000 a kilowatt. ClearEdge's stationary fuel cell takes natural gas and runs it through a membrane to produce hydrogen, heat, water and carbon dioxide. The hydrogen then passes through a second membrane to produce electrons before delivering electric power and heat to the building. In August 2011, ClearEdge Power announced that it has raised a series E round of funding of $73.5 million, from a combination of new share sales and the conversion of previously issued notes. This round brings the company’s funding to about $100 million. Investors in ClearEdge’s latest round include Artis Capital Management, Güssing Renewable Energy, Sempra Energy’s Southern California Gas Company and Kohlberg Ventures. In December 2012, ClearEdge reached an agreement with United Technologies Corp. to buy its fuel cell business, UTC Power. In February 2013, ClearEdge closed on its acquisition of UTC Power. The next month, the company reduced its workforce by 39%, with many layoffs coming at the former UTC unit. Later that month the company announced it had raised another $36 million in capital. the chemical processes being developed promise the scalability needed to competitively replace petroleum-based fuels. Doty's process electrolyzes water and combines the generated hydrogen with CO in a Fischer-Tropsch process to produce the liquid fuels. FuelCell Energy (NASDAQ: FCEL) - Danbury, CT - Develops and operates cell fuel power plants, Direct FuelCell power plants, to electrochemically produce electricity and heat from a range of basic fuel materials including natural gas and coal, etc. As the biggest publicly traded fuel cell manufacturer in the U.S., the company owns about 50 plants all over the world. Besides, it owns and operates the world’s largest fuel cell park, Gyeonggi Green Energy Fuel cell park, which is located in South Korea. The park consists of 21 power plants with 14.9 Megawatts. Hydrogenics (NASDAQ: HYGS) Mississauga, Ontario (US - Valencia, CA)- Has over 60 years of experience designing, manufacturing, building and installing industrial and commercial hydrogen systems around the globe Major manufacturers of PAFC technology. The BuzzBar allows users to charge their mobile devices using virtually any source of energy that can plug into the BuzzBar including; wall outlets, batteries (BuzzBat™), solar power (BuzzSolTM), and the liquid fueled BuzzCell.™. During power outages or in third world countries with unreliable power grids, traditional mobile charging units that must be charged via a wall outlet quickly become useless. The BuzzBar family of products fills this critical gap in the market. The BuzzCell is a fuel cell technology that has no moving parts, under development at Neah for the last two years. The replaceable power cartridge consists of a bio-fuel and supporting electrolyte. Each cartridge is designed to hold one or more Smart Phone charges. PowerChip products are primarily available to military, government and corporate clients based on their specifications and integrated into their applications. The low-temperature GenSys fuel cell system provides remote, off-grid, and primary power where grid power is unreliable or non-existent. The high-temperature GenSys fuel cell system operates parallel to the grid as a replacement for traditional furnaces and boilers in residential and light commercial applications. The combined heat and power (CHP) system runs on natural gas at a temperature between 160° C and 180° C, making it compatible with existing home heating systems – working seamlessly with radiant, forced air or baseboard hot water. Oorja Fuel Cells - Fremont, CA - Specializes in methanol fuel cells, in Q1 2010 released a fuel cell capable of generating 5 kilowatts of power, enough to run a home or small business or to provide backup power to cell towers. It will sit on large forklifts and can be used for auxiliary power for trucks, RVs or marine applications, or for off-grid power for homes or farms. For larger applications, the fuel cells can be chain-ganged together. Connect twenty of them and they would be capable of generating 100 kilowatts of power -- as much energy as the Bloom Energy Server. NFRC - National Fuel Cell Research Center at The University of California at Irvine is the location of the . The mission of the NFCRC is to promote and support the fuel cell industry by providing the research, development and demonstration of fuel cell technologies. NFCRC's goal is to become a focal point for advancing fuel cell technology by creating partnerships with industry and state and federal agencies, including the U.S. Department of Energy (DOE) and the California Energy Commission. Fuel Cells 2000 Washington, DC - Their mission is to promote the commercialization of fuel cells and hydrogen by supplying accurate, unbiased industry information and developing and disseminating summary materials accessible to a general audience. Their materials and information are available free of charge. Fuel Cells 2000 is independent, non-aligned, and supports fuel cells of all types for all applications. How about considering a "Renewable Ammonia Corridor Value Cycling Network Engine?" That's all well and good, but what I want to know is how Fuel cells compare to present battery technology in terms of longevity/shelf-life and disposal. Companies that deal in waste management services are already having problems with products that are not disposable, what will they be able to do with a product like Fuel Cells?